In preparation for this Friday's DELVE Networking event Fabric(ation) + Art, we have been thinking about what things surround us everyday that receive a lot of thought, consideration and talent to come together – to be fabricated. Everyday we walk through the midst of a creative process, as our studio is down the hall from the talented scent creators, D.S. & Durga. We find great pleasure in the subtle, lovely fragrances that drift through the halls, some stronger than others. Recently we stopped at Bird in Brooklyn to go on a smelling spree of their line, and each of us was mentally transported to awesome, unique, imaginary lands. "Fabrication is so important to our work. Obviously in that we create, i.e. fabricate, all of our scents in house. But even more so in fabrication meaning 'made-up story.' Fragrance uses all sorts of trickery to conjure up stories in the imagination and mind of the sniffer," says D.S. From their site: "D.S. & Durga make perfume and cologne in small batches using premium-sourced raw materials. All scents are created exclusively in-house...Though all scent is unisex in nature, D.S. & Durga honor the classical break-down of masculines & feminines...Durga had an idea: she could distill her designs into the architecture of fragrances (and the packages they live in) and D.S. could write songs in scent." So, who else fabricates scents that bring us new mental places, or back to recalling old ones, especially in an art context? 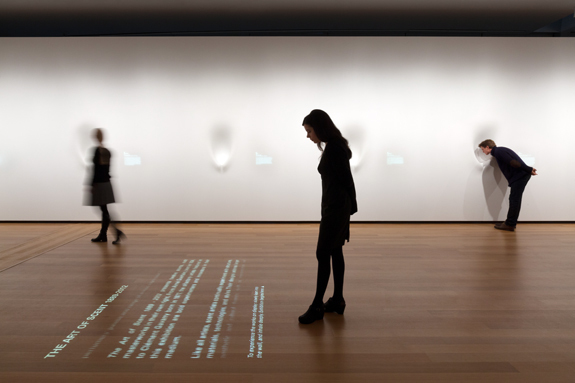 Installation view of The Art of the Scent exhibition at the Museum of Art and Design in New York. (image: Brad Farwell) From this Smithsonian post. The Museum of Art and Design in New York has an olfactory department that is now two years old. Quoted from this New York Times article, “The fundamental goal of the department is placing scent as an artistic medium alongside painting, sculpture and music,” as stated by its curator Chandler Burr. Last year in The Art of the Scent (1889-2012), twelve scents were exhibited and in addition to activating our sense of smell, we loved the challenge to exhibit work that one cannot see. Can you imagine the capability to create the smell of things that don't physically exist in the world, such as fear or happiness? 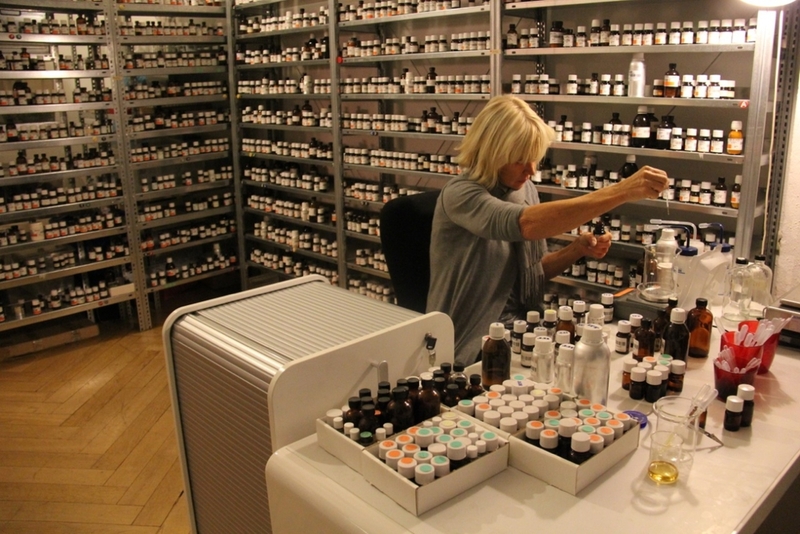 "In a career spanning twenty-five years, Sissel Tolaas has raised these and many more questions, and has collected over 7000 different smells which she houses in her studio lab in Berlin," writes Nish Gera from this insightful interview with Tolaas. Then we stumbled upon the Blind Smell Stick project by Belgian olfactory artist Peter De Cupere, who devised a stick equipped with a "little bulb on top of [it that] has holes in it and it detects the smells. With the use of a few mini ventilators, heating, and filters, the scents reach your nose through a special tube. You can wear dark sunglasses and really focus on the smells or you can also open the dark glasses and take a look at what you're smelling." This article really informs us that smell, or the implication of it, and art have always been combined to create powerful conceptual experiences as well. Some examples of that are the smell of blood during Judy Chicago’s Menstruation Bathroom piece form 1972, and Hilda Kozari’s Air-Urban Olfactory Installation (2003) where the artist created three bubbles that invited her audience to experience the olfactory conditions based on her memories of three cities: Paris, Helsinki and Bucharest. Kozari writes about her work: "The accurate definition of the urban landscapes is given by the sense of smell, which brings to mind different memories. The odor of a city is not just about the sea, wind, parks, buildings and garbage, but also about people, the living environment, and its emotional, cultural and industrial life connected to memory. As in a personal perfume, the smell of the city depends strongly on the balance of odors." As artists, we are so aware of conditions that surround our city space, smell included. In New York City, those smells generally err on the uncomfortable side, which makes interaction with others and recognition of how scent affects our perception of things so much more important.